The curriculum consists of an online student textbook, a teacher guide, specially produced videos, and supplementary materials. 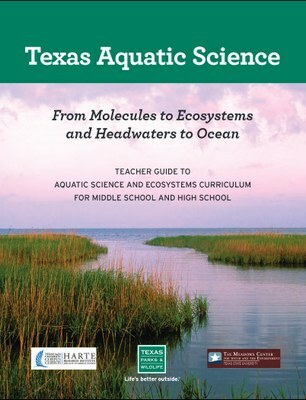 *** New streamlined TEKS in Texas Aquatic Science curriculum. TEKS aligned for 6th-8th grade and for high school Aquatic Science and Environmental Systems. To ensure the protection of answers throughout the Texas Aquatic Science Teacher Guide and its sub-parts, they are password protected. Click the Access Request Form (hyperlinked to the current form) to verify your email and receive the password. To register (5 spots available to non-State Park staff): Email Danielle Knapp-Smith at Danielle.Knapp-Smith@tpwd.texas.gov or (512) 389-8497. To receive the password to access the TAS documents, enter your information on the Access Request Form (TMN put your Chapter for Educational Facility). If you have questions about a workshop contact Melissa Alderson at Melissa.Alderson@tpwd.texas.gov or (512) 389-8060.
and Kindle version available from Amazon.com. Written for middle school and high school students. Designed to help teachers make students aware of the importance of water to life, aquatic ecosystems, and what we must do to conserve water and aquatic life. Students learn and demonstrate their new knowledge in creative products and performances. Lessons embed higher order thinking skills, provide depth and complexity of learning, and engage students in many contexts and methods. 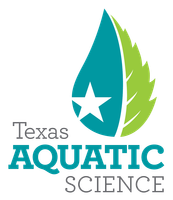 Texas Aquatic Science is a cooperative education project sponsored by Texas Parks and Wildlife, The Harte Research Institute for Gulf of Mexico Studies at Texas A&M University-Corpus Christi, and The Meadows Center for Water and the Environment at Texas State University. Texas Aquatic Science was modeled after the Missouri Department of Conservation‘s (MDC) curriculum, Conserving Missouri’s Aquatic Ecosystems. Support was provided by the Ewing Halsell Foundation, San Antonio and the Sport Fish Restoration Program of the U.S. Fish and Wildlife Service.